Our methods do not follow a rigid protocol that incorporates popular "off-the-shelf" training events. 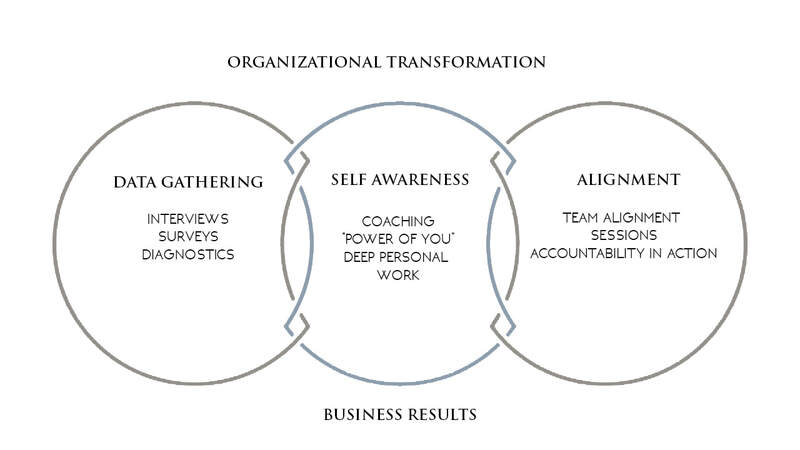 Our solutions, whether it is executive coaching, employee surveys, organizational effectiveness assessments, team alignment sessions or other, incorporate a high degree of customization and are designed to transform individuals, teams and organizations. An important first step in our process is to immerse ourselves in our client's culture, mission and values, perceived challenges as well as those of the industry. This immersion process is critical to our needs analysis phase and our ability to meet our clients where they are. We help them to identify solutions that truly meet their needs and challenges and customize such solutions to ensure that transformation occurs, and that leaders increase the impact to their teams and organization. Throughout the entire process we keep the "end" in mind; helping our client's deliver business results by increasing leadership effectiveness is at the center of our efforts. The vehicle we utilize to navigate from one phase to the next is expert, strategic consulting. We stay focused on what matters the most and help our clients maintain focus and perspective on driving results. One of our values is "quality." We live up to this value ensuring excellence in execution and deployment of our solutions. A project manager is assigned to each project, ongoing communication and guidance is provided and exceptional customer service and quick follow up is at the center of our execution approach. Our commitment to you is to deliver quality services. We believe that our process is complimented by our attention to measuring and following up on progress and results. This is a very important part of our process as it ensures that there is continuity to the efforts, that momentum continues to be created and that the focus continues to be on the changes in behaviors and dynamics that have the highest impact on our client's success.